This technical data was obtained from the manufacturer's website (here). Background and Harmony instruments carry on the Bach tradition of superior performance. Bach instruments are famous for innovative excellence and distinctive sound. You'll find the legend holds true all throughout the Harmony and Background brass lines, from the single and double horns, to the tubas and sousaphones, across the marching field and throughout the concert hall. Designed to live up to its reputation, the instrument line withstands the rigors of student use on and off the field. For added corrosion-resistance, mouthpipes are constructed from red brass tubing which contains a higher copper content than standard yellow brass tubing. Perhaps Bach undertook an publicity blitz heralding their massive redesign of the 1105TH marching mellophone back in 2003 and I managed to miss it completely, stranger things have been known to happen. I saw an image of what appeared to be a King 1120 in an online harmony brass catalog of Bach offerings (here) that indicated either a new model of marching mellophone was being released, or an erroneous image had been incorporated into the catalog. During a visit to Woodwind and Brasswind in May 2007, all questions about the new design were answered when the rectangular aluminum case emblazoned with the Bach logo (a clone of the aluminum King 1121 case) was delivered from the storage area for a play test. 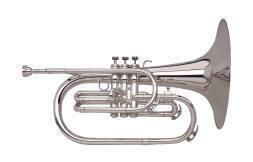 The contents revealed a marching mellophone that is a dramatic departure from Bach's long held compact marching mellophone cornet valve cluster design that has become dominated by the Yamaha 200 series mellophone. A side-by-side comparison of the former 1105TH and the B1105TH reveals the new model is not a design revision, but a fundamental design replacement. Most, if not all online catalogs that offer the B1105TH for sale still utilize the older 1105TH image. The new B1105TH design replaces the design Bach has incorporated since 1979, taking most, if not all of of its design cues from the King 1120. Since Conn-Selmer, Inc. is also now the manufacturer of the King line of instruments, utilizing the time-tested 1120 design is not surprising. The Bach B1105TH and the King 1120 share the same valve cluster and bell flare design. They also both accept trumpet mouthpieces, but won't accept the smaller backbore of the popular Mello 6 Mouthpiece. The Bach 1105TH incorporates several design distinctions that this reviewer views as improvements over the newer King 1121. For instance, the Bach benefits from an important configuration of the third valve tubing that allows the performer increased room for the left hand. The Bach also utilizes a level lead pipe (instead of the new angled lead pipe featured in the 1121). I have no doubt that there's probably some benefit to this lead pipe, I'm nust not a fan. Lastly, the reverse sprung first valve slide that is featured on the King 1121 is not a part of the Bach design. The Bach incorporates the traditional bracing and trim appointments synonymous with Bach's other brass instruments. This is a light instrument and extremely well balanced and extremely comfortable in the hands. The pistons are a bit noisy and the springs can be readily heard when depressing the valves. 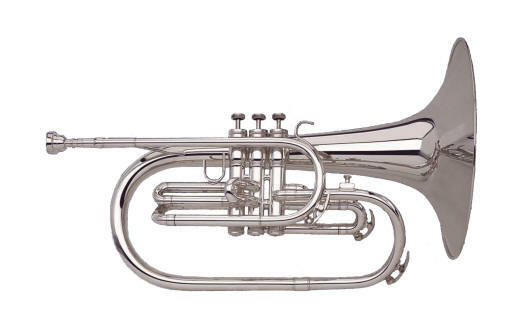 The B1105TH is issued with a Bach 351 6BM mouthpiece, a trumpet mouthpiece with a deep cup, large 26 throat, and a 24 backbore. This is a shallow mouthpiece and a narrow cup diameter for this type of instrument. It also makes already brightly sounding horn sound even more so. Visual inspection of the Bach B1105th suggests the newly designed model is the reincarnation of the King 1120 that was discontinued following the roll-out of the King 1121. Intonation was good, but not exemplary with the Bach 1105TH. Slurs slotted very easily and the upper register was open, but adjustments need to be made by the player to ensure intonation. The smaller mouthpiece made the lower register (below low C) less defined. The 1105TH is very light instrument with a bright tone quality, particularly when compared to the Yamaha 203 or 204 series. However, this instrument appears to have a darker tone quality than the King 1121. Overall, this is a well-constructed instrument that appears to be a slightly better player than the King 1121 design that it emulates. This is a light instrument with a bright sound that is well-suited for younger players.